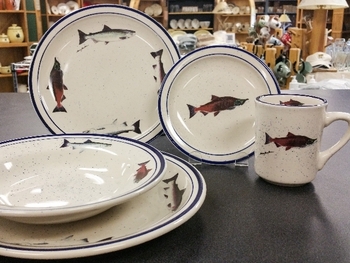 Classic Rustic Blue Speckled Salmon Series 20pc (4 place settings) Dinnerware Set. Features a dark blue hand painted rim with blue speckles throughout each piece. Original paintings of the Salmon Series (Silver, Sockeye, Steelhead and King) are by Dann Jacobus. Decorated by hand in the U.S.A. Dishwasher and microwave safe!